‘Unique’ is an overwrought word, sprinkled liberally to add a beatific halo to things we’re desperate to pluck out of the mundane. Sometimes, though, it applies perfectly; it may even sound a little inadequate. Like when we’re describing Indian textiles—the rich brocades of Benares, wrapped in butter paper, gracing many a trousseau, comprising many an heirloom; the ikats of Patan, Pochampally and Sambalpur across the west and east that confound and astonish in equal measure; the saris of Venkatagiri, where luminescent, rich zari marries cotton that looks too fragile to carry it; the Balucharis of West Bengal that have entire scenes from the Mahabharata and the Ramayana woven on the pallu. Few nations have a legacy of handwoven textiles as rich as our own. 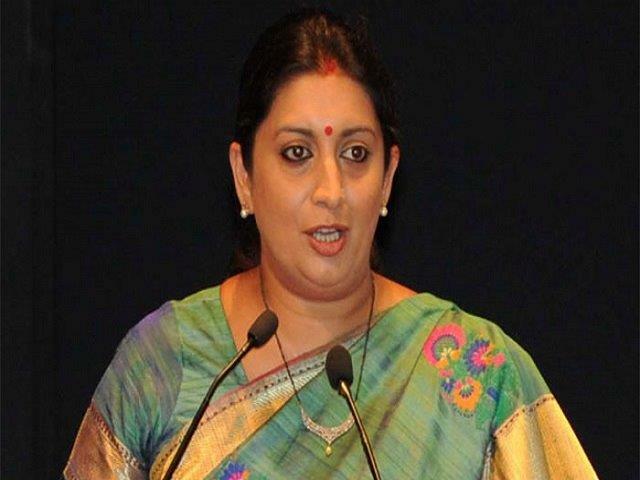 Smriti Zubin Irani, who took over as Minister of Textiles following a Cabinet reshuffle this July, has her work cut out. Powerlooms are phasing out weavers, traditional textile crafts are in danger of dying out, yarn prices are going up, and the market looks more inclined towards speed and quantity than the intricacy of warp and weft. Irani, though, is jumping into the deep end. She heads a ministry where new announcements aren’t likely to make screaming head- lines the way they did at her erstwhile HRD Ministry. But all eyes are on her. She speaks about her plans for the industry, the power of a hashtag, and why the looms won’t fall silent yet. Q: It’s been just a few months since you took over as Minister of Textiles. Among the issues you are looking at addressing, what ranks high on your list right now? A: One of my biggest concerns was that in terms of the world market, the space that we occupy in handlooms and handicraft is quite small in relation to the diversity of products and the legacy we have to offer. The Ministry of Textiles caters to a composite structure, from yarn to fabric. The government has announced a Rs 6,000-crore package for the garment sector, and we recognise this is a sector that has tremendous potential to generate employment. But the beauty of the sector is that our handloom fabrics are unique to our country. My endeavour is to enlist the services of designers, seek exquisite craftspeople, and through their design intervention look at propagating old classics both nationally and internationally. Here lies an opportunity in product diversification. These are the issues I want to address right at the beginning of my tenure. Q: The #IWearHandloom campaign that you launched this August went viral on social media, garnering 22 million impressions on Twitter alone, with everyone from Virender Sehwag to Sunil Sethi to Manish Malhotra tagging themselves. Did you envisage that it would become so popular? A: It was a very small attempt on our end to reach out and integrate a people’s movement with the handloom sector. There has to be a sense of ownership and pride that comes from a handwoven cloth. People think this isn’t something the youth would connect to. But what better way to connect them to a part of our history, our heritage, than a hashtag? I think many individuals and organisations joined us because they saw an opportunity in combining forces with the government’s initiative and ultimately witness a resurgence in the pride one takes in the handwoven cloth. And I’m very grateful that designers and organisations across the board—even organisations that are normally competing against each other—came on board and supported this. I remember being in a meeting with three youngsters, all aged below 30, and asking them how they would connect [with the campaign], and it was these three kids who told me how they would like to see this happen. The impact of the campaign was that we could reach out to our last-mile stakeholder. Q: In a column in the Indian Express this July, Jaya Jaitly spoke about how the thrust of the Textile Ministry’s policies went from providing employment to producing cheaper cloth for the masses in the mid-’80s. What, according to you, is the need of the hour? A: I think we have a great opportunity to use the digital market to connect every single weaver to a consumer who appreciates the art behind his craft. There are consumers who want to support the art but might not be able to afford it. So the idea is to support both segments. Hats off to people like Jaya Jaitly, who, in the absence of a digital platform, managed to help preserve a lot of the craft, managed to keep weavers across the country upbeat about their prospects, because that, in itself, is a huge task. The ultimate aim is to ensure the weaver feels empowered and enjoys the attention that his craft is getting. Till that doesn’t happen, you won’t see the weaver pass on his craft to the next generation. Our aim is to also engage through the many Weavers Service Centres and the IGNOU and NIOS and facilitate the education of the children of weavers. At a time when soft skills assume such importance, we are grateful that we could partner with the Ministry of Skill Development and Entrepreneurship. My endeavour is to ensure that the weavers get raw material from the service centres—raw material that complements their craft. We don’t want a similar template of raw material rolling out across the country because the handloom fabric or weave of one area is unique to the raw material found in that area. I also want to ensure that weavers have a choice in terms of looms. The government will pick up 90 per cent of the cost of the loom. These are the kind of details I’d like to go into. Q: Prime Minister Narendra Modi launched the India Handloom Brand (IHB) last year, where a garment bearing the label fulfils certain quality as well as environmental and social parameters, such as being child-labour-free. How do you plan to integrate the IHB with the industry? A: The brand needs a huge push, as has been envisioned by the Honourable Prime Minister. In one year we’ve managed to register around 60 organic dyes and colours. I think the challenge is that currently the IHB is not intertwined with the whole market in terms of the fashion seasons and the output we see from designers. Though designers take pains to reach out to us, my endeavour is to know the kind of work that is being done under the India Handloom Brand so that there is access to organic colours, dyes and master craftspeople. As long as the master craftsmen and the weavers get paid directly by the designers, we are keen to facilitate that direct engagement. Q: Describe your personal relationship with textiles. A: I don’t have a particular sense of design or texture when it comes to my own wardrobe. I am a haphazard human being. But I do recognise quality. In the presentations that I see, I see a lot of quality work coming from a lot of people. You develop a kind of respect for the sheer detailing that a designer incorporates. I know a lot of people who keep at it till they get the kind of weave they’re looking for. Look at Anavila Misra! It is this pursuit of excellence in a craft that is much needed, and what’s heartening is that it’s the youngsters who are doing it. The fact that they understand the legacy that they are propagating, the fact that they recognise the brand value of it internationally, the fact that they themselves take such pains in getting into the detailing to ensure such quality—I think that is what will take the handloom sector way beyond expectations. Nobody was talking about it; now suddenly I see 18-page spreads everywhere, which is wonderful. Q: With handloom fabric becoming more and more of a niche product, how do you plan to propagate it in the mass market? A: I think the retail sector has a huge role to play there. I’ve been in conversations with representatives of retailers like Shoppers Stop, Westside, Biba and Globus, and they are more than willing to engage with weavers directly. However, because they are bigger retail establishments, they’re looking at a huge quantity and their concern was the quality of the cloth, and that is a concern that with IHB we are trying to address. Q: What plans do you have for the National Institute of Fashion Technology (NIFT)? A: I’m looking at re-hauling the entire NIFT institutional chain from a designer perspective. I’m in conversation with NIFT alumni and designers who have served the design community well. The government is doing a performance audit of NIFT; this would tell me where the lacunae lie. But I understand that bureaucrats and politicians cannot tell you how to design. So there has to be some space left for designers, those who understand technique and love the craft, to come and engage with students. Q: Do you believe that increasingly traditional hand- woven fabric is receding from the daily lives of the youth and becoming more of ceremonial wear? A: I think youngsters embrace their history and their heritage. I don’t see them running away from it if you provide them an opportunity. When I was at HRD, we started a programme called Kala Utsav, where youngsters competed at the state level and made e-books of the art or craft they wanted to present, and then they would compete nationally. I realised that they were more than happy to represent arts and crafts that people thought were dying out. Q: When you reach the end of your tenure at the Ministry, what would you have liked to achieve? A: For me the hallmark would be a new policy that would encompass the variety that the Ministry of Textiles has to service, from man-made fibres to cotton to handloom and handicraft. Secondly, my endeavour is to empower the artisan, because no big business plan or forecast for the entire sector will be pragmatic if we do not serve or preserve the arts and crafts that they present. It’s essential that our artisans and weavers feel empowered enough to pass on the legacy to the next generation. So the aim is to ensure that more and more youngsters understand and appreciate the craft, to ensure that those who have that family history preserve the knowledge, those master craftspeople who have so much to teach nationally also get an opportunity to engage internationally. That’s a huge task.